Bibliography: Bartsch 91; Hind 147; Münz 207; BB. 36-D; D’Oench, Prodigal Son Narratives 1480–1980 (Yale University Art Gallery and Davison Art Center, Wesleyan University, 1995) cat. no. 7, p. 7. 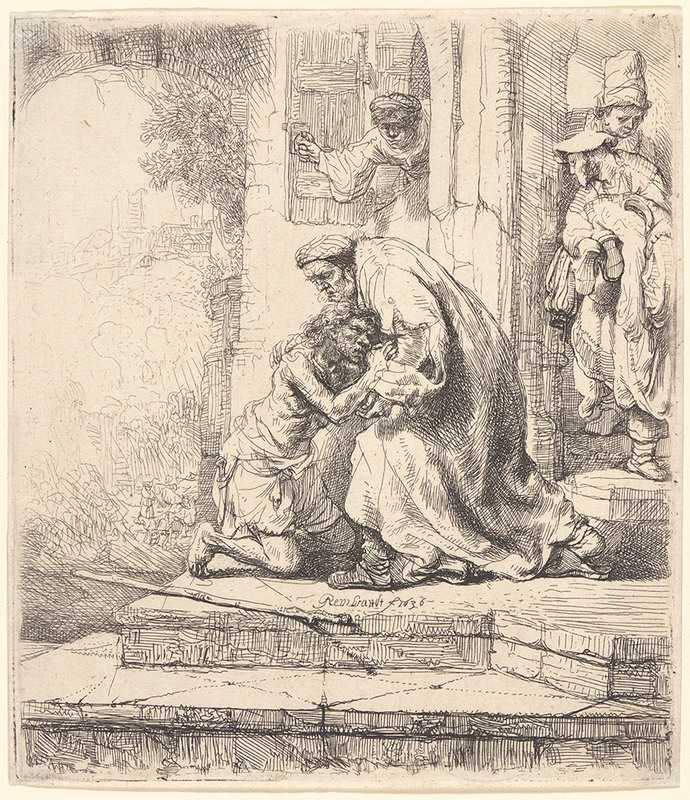 Return of the Prodigal Son, . Etching on cream laid paper. Only state. Plate: 157 x 134 mm (6.2 x 5.3 in.). DAC accession number 1938.D1.50. Gift of George W. Davison (B.A. Wesleyan 1892), 1938. Open Access Image from the Davison Art Center, Wesleyan University (photo: R. Lee). http://dac-collection.wesleyan.edu/obj12006 is a persistent link to this page with no user-session information.